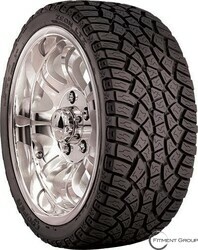 The Cooper Zeon LTZ is designed to perform on any terrain and is the best all-terrain tire from the Cooper brand. The Zeon LTZ is a unique mix of a sport truck and an all-terrain tire. The LTZ provides forceful and off-road ability both on the highway and at home. Drivers will experience superb ride quality and exceptional handling capability from the Zeon LTZ fitted on their sport truck. Features/ Benefits •	Transverse and Circumferential Grooves that direct water away from the tire foot print to increase hydroplaning capability •	Ridged Tire Bars that improve lug stability by locking the lug to deliver improved steering and traction. •	Scalloped Shoulder Design- alternate bordered shoulder lugs to deliver enhanced traction on sand and mud surfaces. •	CAD – Flexible Pitched Sequence that generates a stable pitch for noise reduction, providing a quiet ride. •	All-terrain design to deliver reliable performance on any terrain. •	Alternately bordered shoulder lugs to deliver improved traction on mud and sand. •	Extended "Two Z" element siping that provide long, reliable traction in any weather condition while promoting stability and tread rigidity for extended tread wear and handling. •	Lug tie-in sections that include raised, jagged "lug-locks" between the tread block components to strengthen the tread pattern for improved steering and traction. •	Narrowing deep tread in the center and a little thinner tread in the shoulders to improve wear- ability and wet handling while decreasing weight.